Simple and yet impressive, with a promise to blow your guests away! 2 Ahi Tuna Steaks (I usually buy the frozen ones which require a little over an hour to defrost if left in the packet in a bowl of cold water). For the dressing: 2 tablespoons of mayonnaise, a splash of soy sauce, 1 freshly squeezed lemon (this has become one of my favourite dressings)! 1. Defrost the tuna steaks and wash well. Pat dry with paper towels. 2. In a bowl, mix the olive oil, soy sauce and sesame seeds together and rub all over the tuna steaks. Cover bowl with a plate and leave in fridge to marinate for one hour. 3. Prepare the dressing in a cup or small bowl using ingredients indicated above. 4. Heat up a skillet or grill until hot. Add the tuna steaks and allow to brown. (About 1 minute). Turn over and do the same for 1 minute. Sprinkle a little salt and pepper on each side as it cooks. 5. Now lower the heat to low to medium and cook the fish for a further 5 minutes on each side to ensure the fish is cooked enough. 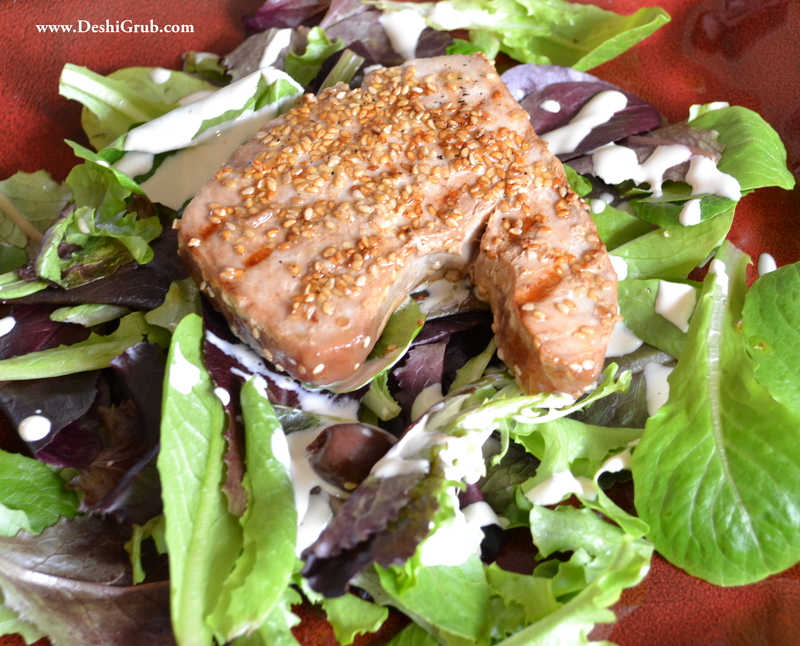 Since they’re Ahi Tuna steaks – they are supposed to remain a little pink inside. 5. Peel and slice the avocado into thin slices and decorate on the plate. Add the olives.